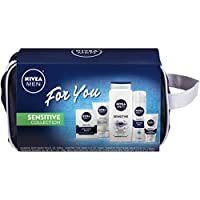 NIVEA Men Sensitive Post Shave Balm was specially developed for men with sensitive skin. It leaves skin looking healthy and cared for and feeling comfortable and smooth. NIVEA Men Sensitive non-drying face wash is enriched with Vitamin E and natural, soothing Chamomile and Witch Hazel extracts. It leaves skin looking clean and healthier as well as feeling fresh and comfortable. NIVEA Men Sensitive Protective Lotion is enriched with Vitamin E and natural Soothing Chamomile and Witch Hazel extracts. It leaves the skin looking healthier and cared for, protected and feeling comfortable. NIVEA Men Sensitive Body Wash is gentle enough for sensitive skin, strong enough to make you feel clean, refreshed and comfortable.